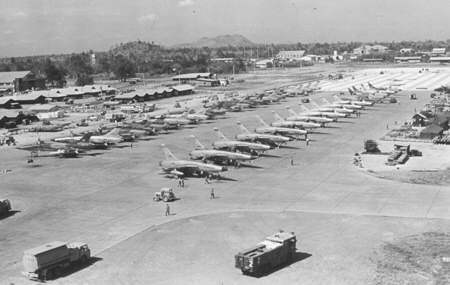 This Takhli Web page is dedicated to all who served at Takhli Royal Thai Air Force Base and in particular the Takhli Air Crews who gave their lives and freedom for their country. I'd also like to acknowledge our hosts at Takhli, the Royal Thai Air Force and the people of the kingdom of Thailand and the village of Ban Takhli. This side of the Combined Website includes photos of Takhli - the base and the village as well as any contributed stories, photos or recollections from the thousands of Air Force men and women who served at Takhli during the Viet Nam war and the parallel "Secret War" on the ground and in the skies of Laos and Cambodia. I was a Weather Officer at Takhli from May 1969 to May 1970 and briefed the F-105 and EB-66 crews of the 355th TFW prior to their Barrel Roll and Steel Tiger missions over Northern and Southern Laos as well as occasional strikes over North Viet Nam. Many units have operated from Takhli RTAFB and tens of thousands of USAF personnel have known it as home in the past 40 years. The base has played a very important role in the United States presence in Southeast Asia. All Takhli vets as well as everyone who served in Southeast Asia should take pride in their service. The TLC Brotherhood is an organization for all vets who served in Thailand and the TLCB along with this website exists to provide a repository for phots and recollections from that era as well as support for vets. Or visit the main Royal Thai Air Force Website.